Composer/Performer Ned Rothenberg has been internationally acclaimed for both his solo and ensemble music, presented for the past 33 years on 5 continents. He performs primarily on alto saxophone, clarinet, bass clarinet, and the shakuhachi – an endblown Japanese bamboo flute. His solo work utilizes an expanded palette of sonic language, creating a kind of personal idiom all its own. 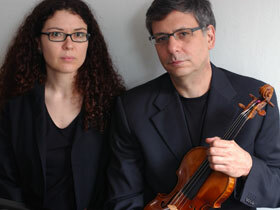 Pianist Sylvie Courvoisier and violinist Mark Feldman will join Rothenberg for an evening of improvisations. They are two of the most spectacular composer-performers working today. Virtuosos on their respective instruments and sensitive, telepathic improvisers, their quest for perfection results in breathtaking new music that seamlessly blends classical composition with the exciting edge of improvisation. All together this will make a real musical summit and a very special event.